Every one who loves to shop perfumes know that it's essential to know what specific product to buy. 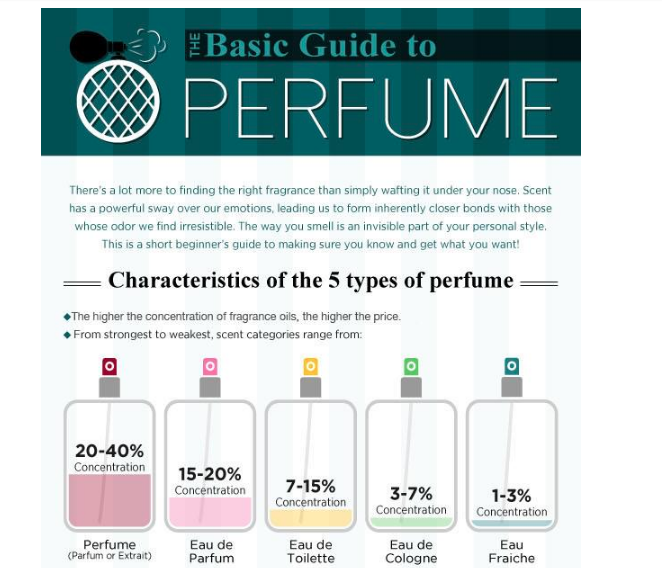 There are informative tips on how to buy perfumes - and in this blog, I'd like to share it with you with the infographics. A lot goes into selecting a fragrance. Humans were designed to be attracted to the scent of other human beings. When we find a person’s scent to be appealing, we may seek out closer bonds. Scents can also have a powerful influence over our emotions when it comes to choosing people we want to be close to. Take time to choose the right scent to attract the right people into your inner circle. · Perfume, also called parfum or extrait, has 20-40% concentration of fragrance and can last up to 8 hours. · Eau de Parum has a slightly lower concentration of 15-20% oils and will be detectable for up to 6 hours. · Eau de Toilette offers a lighter scent with a concentration of 7-15% that will last on the skin for about 4 hours. · Eau de Cologne has 3-7% concentration and may last 2-3 hours. · Eau Fraiche has the least amount of concentration at 1-3% and will last less than 2 hours. · Top Notes – These are the scents that immediately hit your senses when you apply the perfume, but they evaporate quickly. · Middle Notes – Also referred to as heart notes, emerge as the Top Notes dissipate and comprise the essence of the scent. 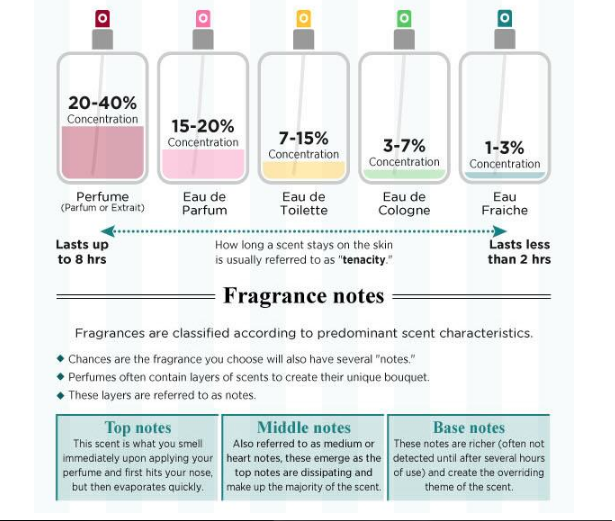 · Base Notes – Are not detected for several hours of wearing the perfume. They are the rich overtones that create the overriding theme of the scent. · Oriental Notes are a mixture of Floral Oriental, Soft Oriental, and Woody Oriental oils. These scents may be comprised of florals and spices. · Woody Notes are earthier in nature and are derived from Woods, Mossy Woods, and Dry Woods. · Floral Notes are a mixture of soft and traditional florals like rose or lavender. 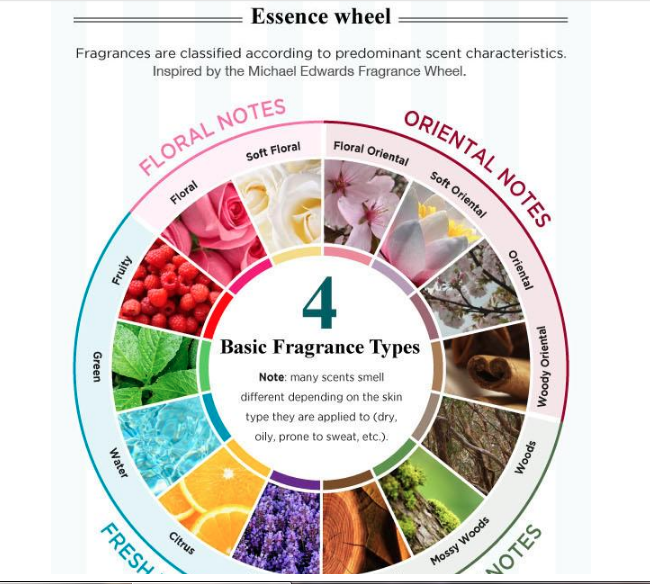 · Fresh Notes make up a large part of the Essence Wheel by incorporating Fruity, Green, Water, Citrus, and Aromatic notes to create layers of scent. Note, perfumes can smell different on different people based on their body chemistry. The same scent can vary based on skin type. For instance, if someone has dry skin, oily skin, or are prone to excessive sweating, the oils in the perfume will react differently. Men and women have different body temperatures therefore fragrance placement will be different for each gender. · Hot Zone – Men produce more heat near the lower jaw, neck and shoulders. Women produce more heat behind the ears, neck and chest. Placing perfume in these regions will allow for the scent to release more quickly. · Warm Zone – Men tend to have less heat generation near their chest and wrist. Women produce less heat on their shoulders, wrist and behind the knees. Dabbing some perfume in these regions will help the scent last longer with a slower release time. · Medium Zone – The inner elbow and forearm are the coolest regions on a man’s extremities. Women tend to have a lower body temperature on their inner elbow, below their midriff, calves and ankles. Applying a touch of fragrance in these areas will help the scent linger. · Winter time is the time to wear stronger more powerful fragrances. When the air is dry and cold, there is less oil for the body to react with to carry the scent. · Summertime is the best time to wear soft fragrances comprised of fresh herbs, citrus and florals. · It is advisable to have an everyday scent for work, outdoor events, shopping or holidays. 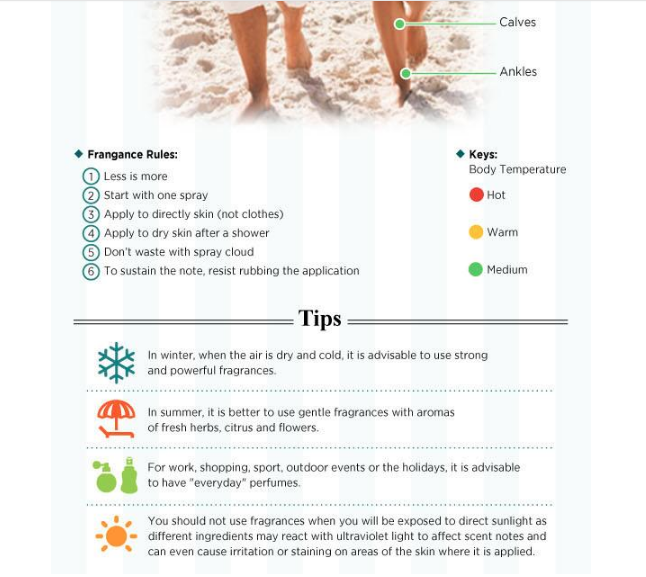 · Don’t wear fragrances when exposed to direct sunlight. Ingredients may react to UV rays and affect the scent notes and irritate or stain the skin where the scent was applied. Get Your Perfume specializes in genuine designer fragrances, bath and body, cosmetics, skin care products and related gifts and accessories for men, women and children.